Are you ready for an Egyptian adventure? 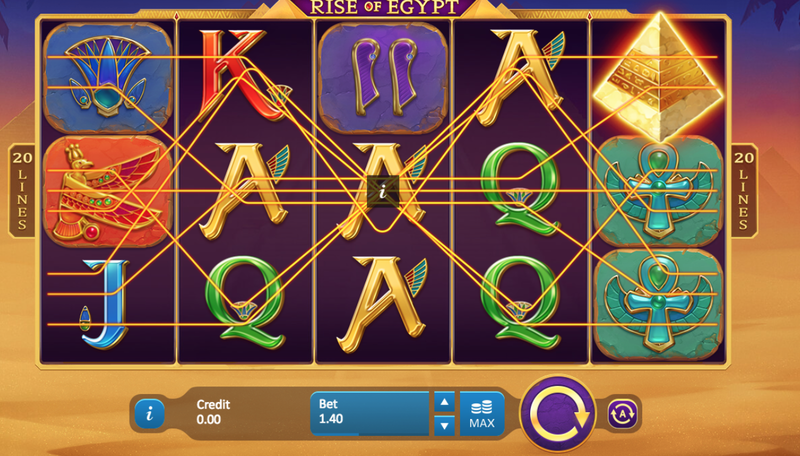 Rise of Egypt is a 5 reel, 20 payline slot with an Egyptian theme. In this slot, you'll explore the ancient Egyptian pyramids hoping to find a secret cave of hidden treasure. There are lots of golden coins and jewels waiting to be taken so grab your torch and get searching! The design is fairly simple with lots of sandy hues and regal Egyptian colours. The soundtrack is fun and upbeat and you'll be walking (dancing) like an Egyptian as you play. There are some great features in Rise of Egypt including a free spins feature with lots of free spins on offer. Follow the link for more. 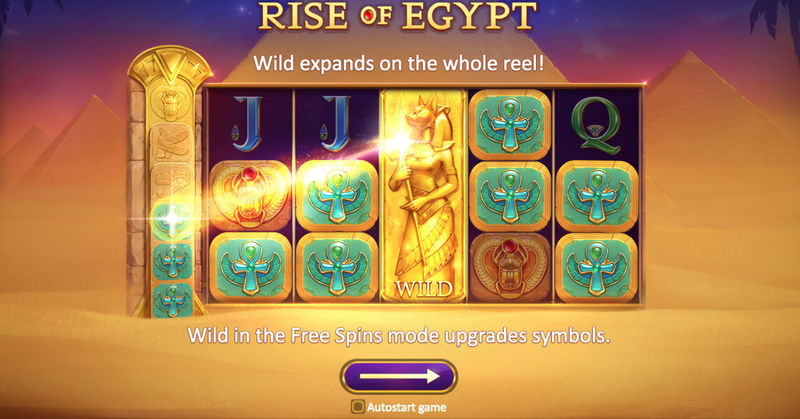 Rise of Egypt is a 5 reel, 20 payline slot created by slot wizards Playson. Explore the pyramids of ancient Egypt to find the valuable treasures that belonged to great pharaohs like Cleopatra and Tutankhamun once upon a time. Will you find the exciting treasure? Hit spin to find out! The design is very sleek with a gorgeous sunset background which blends in with the mysterious golden pyramids. Symbols include a Falcon God Horus, Eye of Ra, golden scarab beetle, and an ankh cross. There are also colourful playing card suits A, 10, Q, K, and J. The Wild Symbol - The wild symbol in Rise of Egypt is the golden goddess Bastet. The wild has the ability to fill the reel entirely with wilds. This creates some exciting golden wins. The Scatter Symbol - The scatter symbol is the giant pyramid. Land 3 scatters to win 2x your stake, land 4 to win 15x your stake, and land 5 to win 50x your stake. 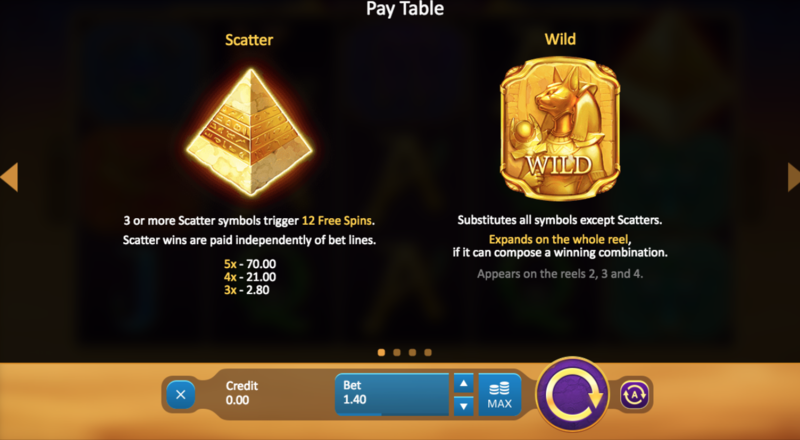 Free Spins - Simply land 3 or more pyramid scatters to unlock the free spins feature. Once unlocked, you will be awarded 12 free spins. Expanding wilds are in play during this feature to help you make some fantastic wins. You can gain up to 35 free spins during this feature, gaining one every time a scatter lands. Playson is a leading Malta-based online casino operator. To create the best games possible, they have a strong team full of software engineering experts, top artists, and mathematicians. Together these people create successful and creative games for game players around the world to enjoy. Rise of Egyptian is a very simple game with straightforward features and a clean design. The design is very minimalistic but is also stunning with the vibrant purples, turquoises, and golds. The highest paying symbol is the pyramid scatter and this can pay up to 50x your stake. The free spins feature is perhaps the most entertaining as there are lots of free spins up for grabs. Follow this link to find out more.